Every week we have 50 cafe volunteer shifts to fill, and 12 kitchen shifts to fill, so we aim to have roughly 65 active volunteers in our crew minimum to make sure we have enough hands on deck at any time of the week! If you love what we’re about and want to be a part of it, if you are looking for ways to make positive contribution, and would get a thrill out of helping a great cause in a very real way, then you will enjoy being a volunteer here. The Art House needs more cafe and kitchen volunteers to keep things running smoothly! Plus, we are always looking for a little bit of help with administrative tasks if that’s more your thing. With all the quirks and facets of The Art House and what we do, you’ll always find somewhere to fit in here. 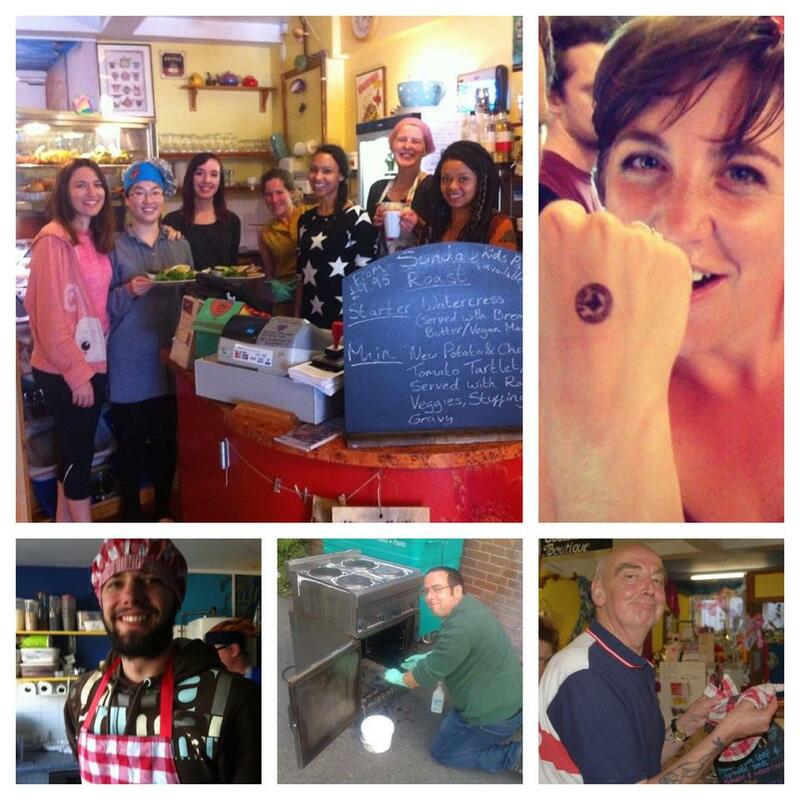 Our financial model is that the cafe (food and drink sales) make the money we need to fund the space for grassroots art, community and more – and volunteers are an essential part of that picture. Having volunteers enables us to buy and operate ethically – using organic, local and fairtrade – preventing the exploitation of people, animals and planet without passing the cost on to our community. This keeps us accessible to as many people as possible without compromising our values. The volunteer roles here are hands-on, rather than creative – most of our crew give their time to support with this – serving customers in the cafe, preparing food in the kitchen, working on the till, clearing tables, talking to people who visit and (of course) washing up! However we also have a few admin tasks that we are looking to hand over to the volunteer team, this includes setting up our regular events and compiling our “What’s on” guides – and this could be done from home! But it isn’t all about hands-in-the-dishwater. Volunteering enables you to make a difference right at the heart of our organisation by pitching in with the many day to day tasks that keep us going, as well as helping to shape our larger vision. Willing to learn and be challenged by our busy environment! Volunteering roles in the café and kitchen are open to people aged 16 and over. As per the council’s child safeguarding guidelines, we are unable to allow people under the ages of 16 to volunteer with us at this time, however we are liaising with the council to try and change this to 14 and over. You will get a real sense of purpose and achievement, gain confidence, learn new skills and make some great new friends – volunteering may well be the best decision you ever make! 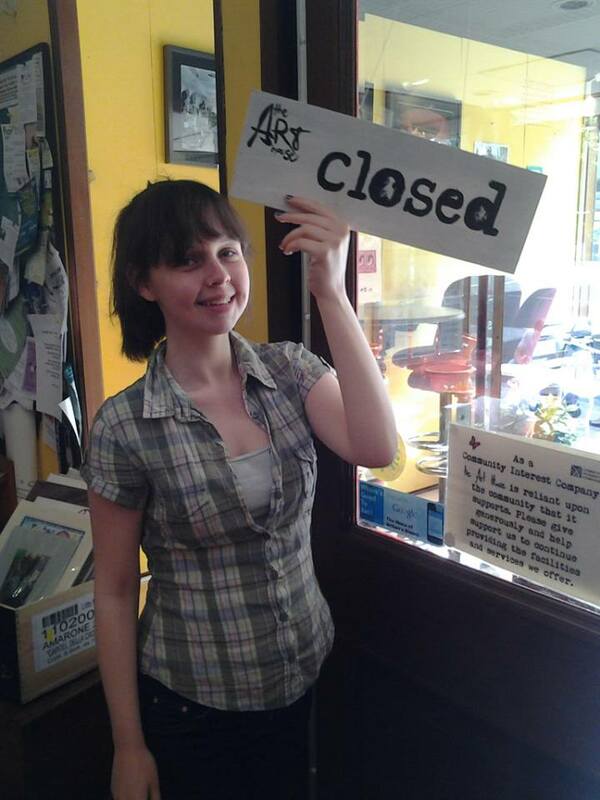 Jade flips the sign to OPEN – something we can only do every day because of our amazing volunteer team. Our everyday work, like the work our volunteers do, is based on small and simple actions, which add up to make a big difference. The impact which providing this space makes to the people who visit here is very large indeed, people who visit and volunteer often say it is a life-changing experience for them. Our way of working is also pioneering a new way of gathering community and doing business, so by helping us you are also becoming a part of a global movement for positive change. Volunteer roles vary from preparing food in the kitchen, to working in the cafe, to some admin support, helping in the Trash Cocktail Boutique and even building maintenance! Being part of a great team, meeting new people and dealing with customers are just some of the skills you’ll have the opportunity to develop. Special volunteer socials and outings, exclusive to our crew! We offer full training, so you don’t need to have experience, just a willingness to learn! Please note that we have a zero tolerance policy to racist, sexist, homophobic, transphobic, ableist any other kind of discriminatory behaviour here at The Art House. We are also actively working to have a more diverse team of volunteers and would like to invite people who are part of minority groups to come and work with us. We warmly welcome refugees here. These will differ according to your volunteer role, but will usually involve working in the café or kitchen, or other tasks which help The Art House to run smoothly. We do have some admin roles, but there are fewer of these. Show a genuine interest in The Art House as an organisation. Demonstrate a commitment to our aims. Have an interest in either the arts, community, healthy eating, veggie/vegan diets or ecological issues. Be supportive of alternative lifestyles including veggie and vegan diets. Be friendly, welcoming and polite. Willing to take instructions from Shift Co-ordinators and directors. Able to work with other volunteers. Reliable, able to work unsupervised and use initiative. Able to speak English well enough to communicate with customers and other volunteers in order to carry out the role. Willing to carry out mundane tasks such as washing up! 8 shifts ‘on the job’ training period – this is usually worked over a period of 10 weeks. You will also be given an introduction session to familiarise you with the workings of the organisation, where you will also need to provide proof of right to work in the UK. Most roles are at The Art House and shifts can be worked flexibly, in most cases between 3-6 hours at least once a month, depending on the role. You will get to enjoy the social and creative benefits of being involved with The Art House, make a positive contribution to your community, receive invitations to volunteer social events, attend certain workshops for a reduced rate and gain valuable skills which can be used in paid work and learn about how to live more sustainably. You will also get a privilege card after 8 shifts, which will entitle you to a 25% discount on food, drink and preloved clothes, as well as some events! Although we are a very creative venue, most of our crew help with food preparation, serving in the cafe and (we’re going to be very honest here) lots of washing up! We need volunteers who are willing to muck in and help with the day-to-day stuff that keeps us running smoothly. Most volunteers start in the cafe or kitchen, as these are good places to learn what we’re all about. There are other opportunities once you’ve settled in to help in the Boutique, in the office, with the crafts, events, art exhibitions, window displays, learning how to mix bands at music events and lots more. We have regular volunteer social events – from film nights to potluck suppers, and of course there’s always plenty of time whilst you’re working to get to know each other. What kind of people volunteer at The Art House? We are looking for people who have genuinely connected with our aims, understand what we are about and who want to offer their time to support what we do. Our volunteers are a very diverse bunch of all ages, backgrounds and personalities. If you have specific needs to help you work here, we will do our best to find a way to support you. Most volunteers come in about once a week for a four hour shift – the minimum is once a month. Talk to us about your availability, as we’re not inflexible on this – we recognise that people have lots of other commitments, too. Shifts can be regular, or you can let us know when you’re available week to week – it’s up to you. Lots of our crew take short breaks in volunteering when their lives get busy – that’s also fine! We will contact you, usually within two weeks, to let you know if we have any roles which may be suitable for you. You will then be invited to complete an introduction where you will have the chance to learn more about us and chat to us about when you would like to volunteer and what kind of work you would like to do. If you want to know anything more, or need help filling in the form, please call 02380238582. After applying, if we have a role that is suitable, you will be invited to an introductory session where you will learn more about the role and meet some of the co-ordinators. There are even creative tasks to be done! Do you do gluten free foods?